This is a sponsored post written by me on behalf of LastPass. All opinions are 100% mine. From coming up with content ideas, writing blog posts, creating pinnable images, sending emails, interacting on social media, submitting articles to online magazines, pitching ideas to brands, trying to get noticed in Facebook groups, taking killer photos for your Instagram feed, and staying on top of administrative tasks, it can feel absolutely impossible to stay on top of everything, and no matter how hard you try to keep your head above water, it feels as though your never-ending list of things to do just keeps getting longer and longer. There’s always a course to take, a new social media platform to master, or a technological problem that needs to be solved, and even the most productive of bloggers often find themselves feeling as though they are drowning in the minutia of it all. The good news is that, even though it’s impossible to predict and prepare for everything single thing life throws at us on a daily basis, there are things we can do as bloggers to stay ahead of the game so we aren’t constantly racing against time. Which brings me to the point of today’s post. As I approach my fourth anniversary as a blogger next month (gasp! 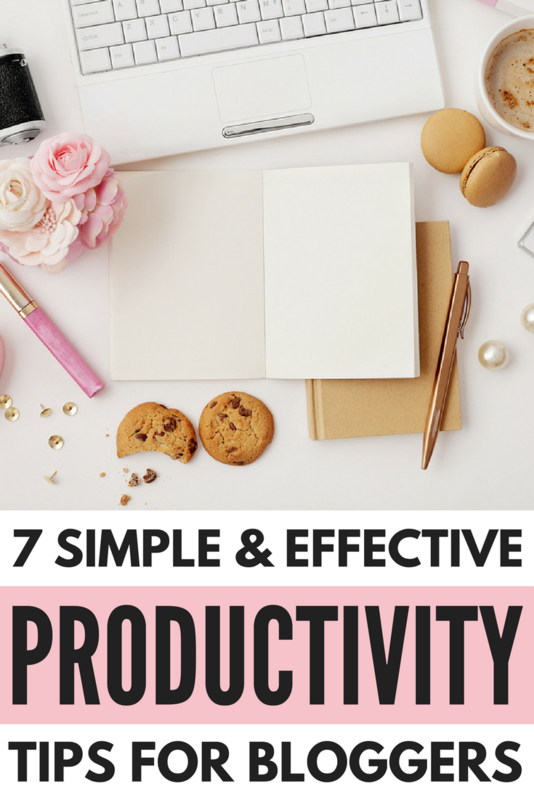 ), I decided to team up with my friends over at LastPass to share 7 of my best time-saving hacks for bloggers that have increased my productivity so I can get more done in less time. One of the best things I did when I became serious about blogging was to put together an editorial calendar and block off time every quarter to plan out relevant, seasonal content that will not only resonate with my audience, but also attract new readers to my blog. By taking the time to plan ahead and identify areas for growth and opportunity, I have a much better grasp on where I should be focusing my efforts, and I no longer spend half of my mornings staring at a blank screen wondering what I should write about. I’ve read a lot of articles and books about productivity over the years, and this trick is one of my favorites. The idea is to take 5 minutes each morning to write down the 3 things you want to accomplish by the end of the day. You must ensure the list is manageable, especially since life has a way of throwing us curve balls that make it impossible to get through an entire laundry list of action items, and you then dedicate your most productive time to accomplishing those 3 things. I’ve always been a proponent of managing my TIME effectively, but learning how to manage my ENERGY effectively has been a total game-changer for me. By pinpointing exactly when I’m most productive, and then taking advantage of that time to tackle the 3 goals I’ve set for myself each day, my productivity has increased by about 80%! While I enjoy interacting on social media and feel like hyperventilating into a brown paper bag when my inbox gets out of control, I’ve learned to focus on mindless tasks when my energy is at its lowest. I respond to emails while I’m eating lunch, scroll through my Facebook feed when I’m in line at the grocery store, and do all of my boring administrative tasks when I’m sitting in front of the TV at night. ‘Batching’ involves grouping relevant tasks together and tackling them in one go, rather than splitting them up over the course of a few days. I’ve been using it with work for a couple of years now and can attest to how effective it is in making me work more efficiently, but I had never thought of applying it to all of the other things I have going on in my life. I now try to dedicate one afternoon (or one full day, if needed) at the end of the week to tackle non-work related items – laundry, groceries, doctor appointments, etc. – and find it really helps. Not only do I feel a million times lighter when I reflect over my day and see how much I have accomplished, but I’m no longer breaking my concentration every single day by trying to borrow bits and pieces of time to accomplish unproductive tasks. As bloggers, we have a tendency to try and do everything ourselves, and while this is a necessarily evil while we try to get our businesses off the ground, it can really hinder our success. When we’re bogged down with the day-to-day, we’re unable to recognize opportunities and focus on the things that are most important, and while it can be difficult to let go and allow someone else to manage something we’ve poured so much blood, sweat, and tears into, the reality is that we cannot grow our businesses unless we focus on the most important, critical tasks. As a work-at-home mom who is stretched thin, I am forever trying to find ways to simplify my life. I write and schedule my blog posts and social media shares a week in advance, I have several canned responses in my email to make managing my inbox easier, I repurpose old content, and I recently discovered a really cool application that saves me a ton of time when I log in to work each morning. It’s a free, simple, and secure password manager that helps millions of people around the world stay organized and productive by remembering their passwords using a secure password storage system that makes online activity easier and safer. Remember my passwords has always been something I’ve struggled with. Of course, having the same password for everything is a recipe for disaster, and storing your passwords in a notebook or your email can be very dangerous, so when I heard all of the awesome things LastPass has to offer – storing all of my passwords in an online LastPass vault, autofilling usernames and passwords for me, backing up and synching my passwords across multiple devices, offering secure notes so I can store insurance card info, WIFI logins, passport numbers and more in one secure place, as well as options to make my online shopping easier and safer – I had to give it a try. I used to spend so much of my time resetting passwords every time I had to restart my computer or access information from my iPhone, and while it sounds like a small task, it really broke my concentration and impacted my productivity. But when I learned about the two-factor authentication LastPass offers – which adds another layer of security by requiring a second login step before granting access to your vault – I knew it was a service that would save me time while simultaneously offering me peace of mind. And did I mention it’s free?! And he was 100% right. While putting the right plans in place to help build your business may seem overwhelming and time-consuming, the pay-off will be worth it. All you need is a little faith. If you found these time-saving hacks for bloggers helpful, please share them on Pinterest!